No, wait! Come back! I'm going to make this good, I promise! I believe Ke$ha will be a victim of her own image -- an image that I feel will be difficult to maintain once the novelty wears off (and it's already starting to). Oh, yeah. Melismatic is going all introspective on you. While the same argument could be made of Gaga herself, I feel it's a bit more pertinent to Ke$ha. I'm not here to knock Ms. Ke$ha, the person. I included "Tik Tok" on my list of the Top 29 Songs of 2009, and I stand by it. It's catchy as hell -- and as I've stated before, pop doesn't and shouldn't have to be taken so seriously all the time. We're in a recession, for crying out loud. Our business is one of the few that can be raucous and rowdy, because people need that escapism. That said, am I over-the-moon excited for a full record of "drunken" sing-talking? Not exactly. "Tik Tok" started making the blog rounds around the midway point of 2009 after the success of Flo Rida's "Right Round", but didn't see commercial success until recently. And I mean very recently. Hence the "overnight" term that will be attached to her name until she proves she can continue to replicate "Tik Tok"s success (complain about Gaga and her overexposedness all you want -- homegirl brought home the money between her two records...and has a third on the way for 2010). Do I think "Tik Tok" will be the "Mambo No.5" (or in her case, more likely the "Tubthumping") of this decade? Who knows? But I do know girlfriend's window opportunity to prove herself is shrinking by the day. If today's pop music world has taught me anything, it's the fact that you could be a hot topic one day, and the 2010 equivilant of Vitamin C the next (what did happen to her career, by the way?). I suppose the biggest turn off is her vocal delivery. After perusing her debut Animal, I was struck by just how similar it all sounds -- and not in a cohesive album direction kind of way. "Your Love Is My Drug" and purported second single "Blah Blah Blah" (which disdainfully features an act I seriously wish would just go away -- 3OH!3) feature the same bratty vocal underlined by virtually the same ringtone-y synth. Once you get over the novelty of "Tik Tok", because let's face it, it didn't really sound exactly like everything on the radio when it first reared its head, and it still doesn't...to a degree, Ke$ha's appeal starts to wane because the prevalence of her sass-singing wears thin. Perhaps I'm a nostalgic, but I tend to prefer my popstars to have at least a passable voice to rely on (at the very least, to mime along to during performances). 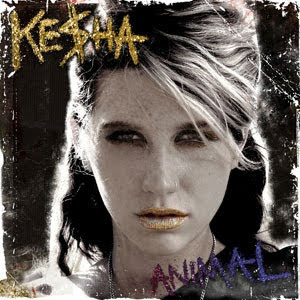 We don't get to really find out much about Ke$ha's voice, because it's more about maintaining this image of the cliched but seasoned party girl. I've maintained that unless she could come up with a good followup single to "Tik Tok", she would fade into the recesses of our pop memories as a "Wonder What Happened To Her"/"One Hit Wonder" type of territory, no matter the production arms behind her (she is repped major by Dr. Luke, has a track by Max Martin, etc.etc.). It's not that Animal is awful, I've certainly heard worse, but in terms of her gaining this label of the pop realm's new golden girl, worthy of competing with 2009's favorite new It!Girl in Lady Gaga, seems overly ambitious. If she's smart, she'll skip "Blah Blah Blah" and go with the Claude Kelly-penned "Take It Off". Other than "Tik Tok", it's the only song off the entire record that truly struck a chord with me upon the first few listens. So much of the album is cluttered with posing and posturing (a pitfall that turned me off of the current Rihanna offering), that I start to wonder if this is really the type of image RCA Records expects to maintain for a career, rather than a few catchy singles...but in this download dominated market, who's to say having one hit song is not a sufficient career? Sure, "Dinosaur" is kind of funny. "Backstabber" is kind of relatable. But overall, the album relies far too much on Ke$ha's carefully crafted surliness. Forgive me for becoming a bit jaded in my pop listening, it's just it feels...contrived. Surely, you jest, Mel, I know you must be thinking. Aren't most pop singers careers planned out for them? I'm not naive enough to believe that this isn't true. It's just in Ke$ha's case, it's particularly apparent. I'm not here to say she's a faker, I don't know her. However, her first entrance into the public sphere was as a free-spirit bumkin on 'The Simple Life' alongside Paris Hilton and Nicole Ritchie. No, I'm not kidding. The problem is, she is the first solo female "electro" (I use quotes because so many American artists use the 'electro' tag, when they aren't really electro at all, Ke$ha included) act to hit the US market in a big way since Lady Gaga, so in this way, she is doomed to comparisons and confusion. Just as Jessica Simpson's and Mandy Moore's careers suffered when they were compared to Britney Spears and Christina Aguilera, so will Ke$ha's to Lady Gaga. And there are other warning signs, too. The borderline obnoxious inclusion of '$' in her name is one, and her promotion campaign centered around the reverse psychology of 'Ke$ha Suxx' (with two x's?) is another. I don't like to think I'm too prudish when it comes to pop, but her fueling of this trashy image doesn't feel organic, it just feels like a desperate attempt to be cool -- and should we really be praising this kind of image, crafted or otherwise, in a mainstream movement kind of way? The excitement surrounding her continues to build and build, and I'm sitting here wondering where it's all coming from. "Tik Tok" is fun and all, but can she continue that momentum? The scariest thought to me is she may be able to pull off what seasoned vets (and unarguable talents) Mary J Blige and Alicia Keys could not, and knock Susan Boyle off the top of the album charts. What does that say about our country on the whole? i'm very late to the kesha party - i do quite like tik tok all of a sudden, but the whole album isn't outstanding, though there is enough on it to keep me interested. On an unrelated but sort of similar subject - i quite like the new Eva Simons song!! After TiK ToK sold 610k I'm surprised the albums only predicted 100k, well it is January. I was disappointed with album, it was good for the first half and weak on the second. She have easily made something more solid. I agree she probably will be a victim of her image. Why does she act drunk all the time? When she was in the UK she burped during her performance... I'll give you time to contemplate on that. Oh yeah, what would you rate it out of 5? Loy - True on the comparison to Dolly Rockers. I guess I'm more fond of them because they aren't completely overexposed in America like Ke$ha is becoming. Hmm...something to think about. J - I'm sure it will sell much more. It's expected to outstrip Susan Boyle, and apparently that is quite a feat in America. What bothers me is so many people are shouting that she is a songwriter first and foremost, but I don't get that from these songs that seem shallow as the shallow end of a wading pool. It all feels contrived and not in an interesting way. If I had to rate it, it'd probably be a 2 out of 5. Honestly, I only kept "Tik Tok" and "Take It Off." I tried, I really did. I just can't get into it. Yeah, I'm just not feeling it with Kesha. Whether it has something to do with her blatant copying of Dannii Minogue's $ucce$$, or the fact that I have enough drunk skanks for friends and don't need them as popstars too - I'm really not quite sure. Anwyay, I've not heard the album yet - but I'm looking forward too it! The song is brilliant, and I'm interested to see how it all pans out - Hopefully good for her! I actually enjoyed reading it, you're a great post.